Blair's Reversible Back Camera is a traditional front focusing field view camera offered in the 1890s. 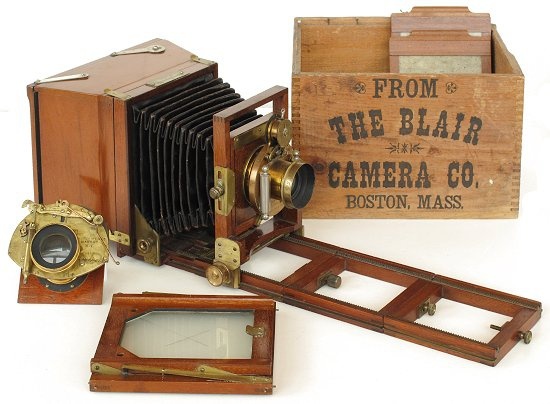 In its basic form, the camera has all the traditional features photographers needed such as rise/fall front standard, tilting rear standard, folding rails, and a reversing back for portraits and landscapes without having to rotate the entire apparatus. This outfit is unique in that it also includes an extended rail system and Blair's patented extension back. Several different backs that could upgrade a camera to the next larger format were offered. The extension back shown here upgrades the 4 x 5 inch camera to a 5 x 7 format. The idea of changing formats on a single body was not new and featured on Anthony's Patent Duplex Novelette Camera in the 1880s. However Blair's approach was significantly simpler in that only the backs were swapped. In contrast, the back and bellows had to be exchanged as a single unit on the Duplex Novelette. Blair Reversible Back Camera with patent extension back (4 x 5 to 5 x 7 inch conversion). Outfit includes rail extensions, extra backs and lenses to match formats. and plateholders.